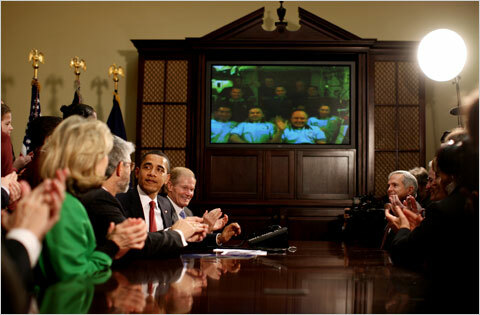 President Barack Obama, joined by Washington-area middle school students and members of Congress, held a video conference call with astronauts from the space station and from the shuttle Discovery in the Roosevelt Room of the White House. 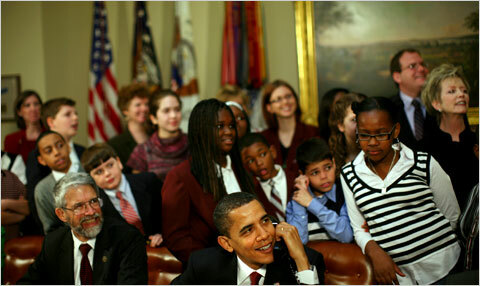 “We’ve got a crew of wonderful schoolchildren here, who are all interested in space, and we’ve got some members of Congress, who are like big kids when it comes to talking to astronauts,” President Obama said, according to a transcript from the White House. The students and the president quizzed the 10 astronauts on what they eat, how fast they are traveling, how they exercise in space, the number of stars in the sky, what they do besides working on experiments and how weightlessness affects their sleep. “Can you play video games in space?” one student asked. “What things did you have to study to be a astronaut?” asked another. « ‘Unclench Your Fist’: President Obama echoes George W. Bush’s Second Inaugural.